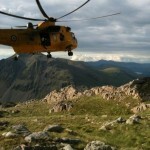 We were contacted by Cumbria Police for a pair of walkers who were long overdue from a walk up Scafell Pike. They were attempting the 3 peaks challenge in horrific weather. As the Team leader was gathering information the two people turned up safe and well in valley bottom. The team was called out to rescue a member of a three peaks challenge group from near the stream crossing below Brown Tongue. He had a leg injury and was unable to complete the descent. We gave casualty care before stretchering him down to Brackenclose. 14 team members attended. 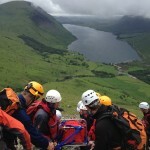 The team were contacted by a lost group taking part in the Three Peaks Challenge. They were close to Lingmell Col and were given instructions over the phone to help them descend to Wasdale. After a short time they met up with another group of walkers who helped them down. 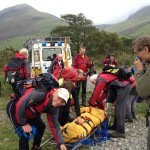 The team was called out to rescue a walker who had taken a stumble fall and sustained a head injury on the Summit of Scafell Pike. After administering casualty care and with help from eight members of Duddon and Furness MRT we stretchered her down to Wasdale via Lingmell Nose. At 03:30 a call came in for a group of 12 doing the 3 peaks challenge who were lost and tired. We gave them some advice over the phone, they made their own way off the mountain this morning.